The Town of Durand passed a zoning ordinance into law on September 18, 2008. The zoning ordinance is a code for developed districts like residential or agricultural or any other district to provide guidelines and regulations for the use of the land within each district. Land use permits are required in all the zones to maintain the requirements established for each zone. The required land use permit is not a building permit. A building permit may be required from the towns building inspector after the land use permit is obtained. The zoning ordinance also identifies the procedure for a zoning variance to the code or a conditional use allowance when one may be required within a zoned district. All new construction requires a land use permit from our Zoning Administrator, Patrick Beilfuss with Cedar Corporation. Please contact the zoning administrator at 800-472-7372 for information on how to obtain a land use permit. 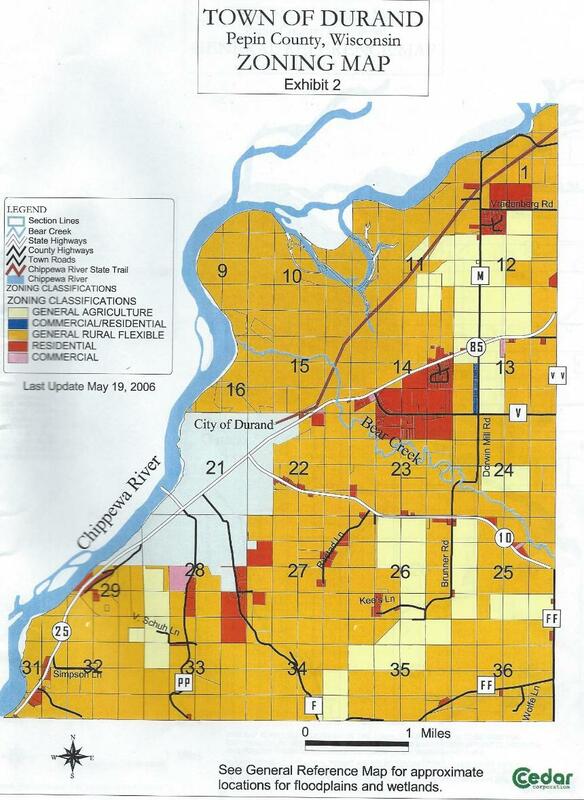 The fees charged for each land use zoning permit was established by the Town of Durand. It is important for all residents to adhere to the guidelines and obtain a land use permit followed by a building permit. Fines for failure to obtain a land use permit will be enforced. Find complete procedures and forms online at http://weberinspections.com/, or contact Fred Weber, our UDC (Uniform Dwelling Code) Inspector at 715-556-0066.